Modern ergonomics is the name of the game in 2013. The latest and greatest cutting edge technology has paved the way for innovative new products sure to improve the versatility of any work environment. That being said, height adjustable desks are amongst the most popular new solutions for ergonomic offices and will surely increase your business effectiveness. This article highlights the absolute best height adjustable furnishings to keep your office operating at the highest levels of productivity possible! The world of height adjustable executive desk solutions will leave you at a shortage of quality options. No need to fear however because Ergonomic Concepts has the perfect desk for you. The 6048-L3 station will have your office ergonomic problems solved with a quickness. With a broad range of add on accessories like desk pedestals and modesty panel options, this electronic desk is totally customizable. Available in 9 cool surface finish options, the carbon fiber and cherry selections are the most popular. This high tech station features 3 electric columns and raises at 1.75" per second. The heavy duty surface will hold 450 lbs. of weight capacity and the full range of motion extends from 24" to 50" to meet your individual height preference. You've probably heard of ESI Ergonomic Solutions if you've every purchased computer accessories for the home or business. However, this incredible brand has broken free of the accessory label and introduced a wide variety of Track Mounted Work Station solutions for technology intensive environments. These cool little units provide a ton of helpful benefits and a wide range of adjustment capabilities. The easy to mount track enables the monitor, keyboard and CPU to slide separately for optimal positioning. 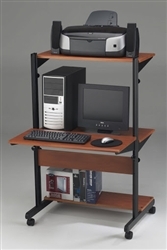 PAC style stations like these are ideal for use in patient rooms, schools and libraries and save a ton of space. If you're in search of new ergonomic furniture for the home or business, Mayline is the brand you'll want to start with. This long time favorite brand of furniture professionals and interior design teams has paved the way for the height adjustable ergonomic workstations of the future. Lines like the VariTask Table series provide simple to operate hand crank and electronic assist height operation that's easy to appreciate. Basic table versions are available along with larger corner models for increased space saving benefits. The top VariTask models offer a keyboard platform mechanism that adjusts from 8" below to 7" above worksurface. 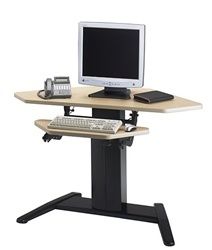 Most of the height adjustable desk models offer 16" of vertical adjustment from 26" to 42" overall. The full travel time is a minimal 18 seconds! Architects and artists are commonly in search of height adjustable ergonomic desks to provide a wide range of benefits for their space. Products like the Techworks series height adjustable work bench by Mayline offer the perfect solution to their needs. 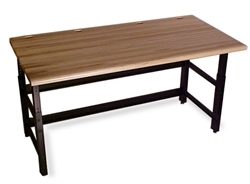 Available in the popular butchers block top table version or with any of Mayline's laminates, these unique products are built for areas where heavy duty office furniture is a must. This isn't just some low grade art table! The Techworks line is commonly used in networking environments, high intensive workshops, and other industrial applications. Creating a versatile office means providing yourself with ample work options to complete any given task. To do that, you'll need a station designed around accompanying any type work style. The Mayline SOHO desk offers sit and stand capabilities to meet the needs of your varying work day. This standing desk features a black metal frame and shelves that are adjustable to an infinite amount of locations between 14 to 48 inches without the use of tools. 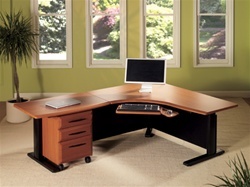 These simple ergonomic workstations for sale are great for both home and business use. Available in both cherry and anthracite surface color options, the SOHO can meet the decor needs of any modern space. If you're looking for not so ordinary small computer desks for sale that will impress, this is the product for you! Priced at only $248.99, the 8432SO is also an excellent value and makes a perfect gift idea. No matter the style of space you're looking to create, ergonomic office furniture can help. Providing versatility while improving efficiency is a goal of any home or business environment. To do it, you just have to know the right products for the job. Shop brands like Ergonomic Concepts, ESI, and Mayline Furniture for Sale to get your office designed on the right foot!